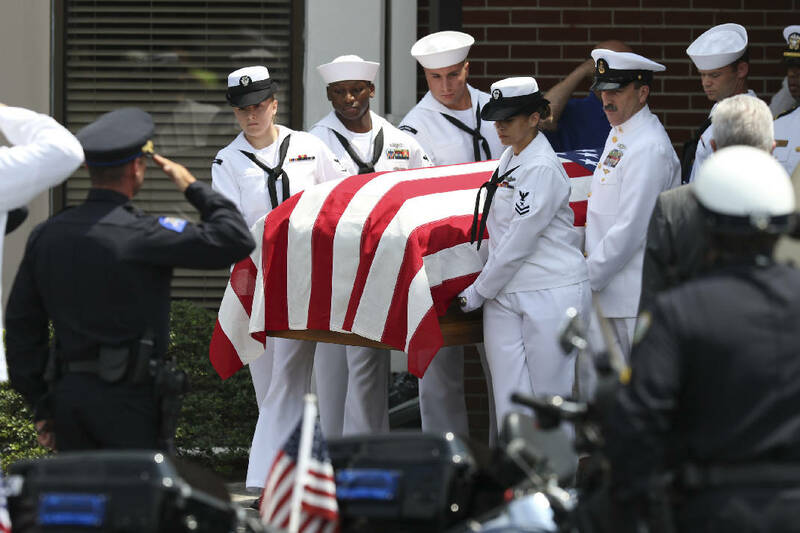 Pallbearers carry the casket of Navy Petty Officer 2nd Class Randall Scott Smith out of First Baptist Church in Fort Oglethorpe, Ga., before transporting him to Chattanooga National Cemetery on Tuesday. FORT OGLETHORPE — Through the first stanza, the woman in the dark blue dress was perfect. Then, just for a second Tuesday afternoon, Angie Smith's voice broke. "There's truth in your eyes," she sang, "sayin' you'll never leave me." Years ago, before the marriage and the three daughters and the move to Chattanooga, she met a man at a karaoke joint named Randall Smith. He was young, and he was smitten. He told friends he was going to marry her. And when she took the stage to cover "When You Say Nothing At All" that night, he watched her. And when she reached that line, the same one she approached on Tuesday, Smith hopped up for a call and response. "I'll never leave you!" he yelled. But on July 16, when a Hixson man whom the FBI describes as a "homegrown extremist" attacked the U.S. Naval and Marine Reserve Center on Amnicola Highway, the gunman fatally wounded 26-year-old Smith. A U.S. Navy petty officer, Smith was one of five military servicemen to die because of the attack. On Tuesday, friends, family, police officers, military personnel and elected officials gathered at First Baptist Church of Fort Oglethorpe for Smith's funeral. They filled seats on two floors and listened to stories about Smith. They heard how he loved Duke basketball, Miami Hurricanes football and Houston Astros baseball. They heard about his career on the mound, how he pitched at his high school in Paulding, Ohio, then at Defiance College. They heard about his shoulder injury, how it ended his playing career, and how he joined the Navy soon after. They watched a video of him singing in the car with his three daughters. Jason Thomas, the lead pastor of First Baptist Church of Fort Oglethorpe, preached about how the city has rallied around the memory of Smith and the other four fallen servicemen. He praised the police officers who rushed to scene of the shooting and the trauma doctors at Erlanger hospital who worked for 1 1/2 days trying to save Smith. Thomas also acknowledged the Chattanooga residents who have paid their respects to Smith and the other four fallen servicemen since July 16. "What you're doing is the type of love God has for us," Thomas said. "It is a love that shines through the darkness. It is a love that cannot be defeated." About an hour later, the funeral procession drove from the church to Chattanooga National Cemetery, passing thousands of people who lined the streets. On Amnicola Highway, where Smith was shot 12 days earlier, the procession drove under a large American flag, suspended by the ladders of two firetrucks. The group who came out Tuesday was thinner than the one on Friday, when U.S. Marine Staff Sgt. David Allen Wyatt was buried. Maybe the threat of rain kept people away. Or maybe exhaustion did. Since July 16, residents have attended vigils, gathered for days to rally at the site of the shootings and lined the streets for two local funerals. They brought American flags, patriotic pinwheels and posters. They signed banners and sang hymns and erected a wooden monument. And they didn't just do that here. Smith's funeral capped five burials in five days, from Chattanooga to Wisconsin to Canton, Ga., to Massachusetts and back to Chattanooga again. And in all those locations, hundreds showed up, most of them strangers to the victims. But why? When asked, almost all of them said they came to show support — for the fallen, for their families, for the members of the military who remain. But what does that mean, to show support, beyond the surface-level definition? Michael Weaver, a Marine Corps veteran who waited outside First Baptist Church of Fort Oglethorpe on Tuesday afternoon, said gathering together shows America's enemies that its citizens will not "roll over." Diane Davis, who greeted the funeral procession at the cemetery, said lining the streets might validate for the family that Smith's cause was important. Michelle Wheeler, also outside the cemetery, said she wanted her presence to show Smith's family that the residents of Chattanooga share their grief. In the Jewish tradition, family members who lose a loved one will "sit shiva" for seven days. They won't work, shave, bathe or enjoy any pleasures. Their comfort comes from the friends who sit with them. Rabbi Bill Tepper of the Mizpah Congregation said sitting shiva helps the family begin to heal from their loss. But the visitors play an important role. They give the grieving strength to continue living. "To visit a house of mourning — where shiva is taking place — is a very, very good deed," Tepper said. For Chattanooga, though, after 12 days of public, communal grieving, what do people do next? Do they return to their lives as normal, now that the final serviceman has been buried? Ron Pongetti said the city's next step is to pray continually for all the family members of the fallen. Chuck Lopopolo said the city needs to prepare for the end times, as described in the book of Revelations. Mike Cooper said the city needs to simply support the local military members, however they can. Ashley Bordon had a simpler answer to that question: "We don't know what's next." Two hours earlier, though, back at the church, Angie Smith's voice had just broken, for a second. But the music kept playing, and she continued to the next line. And, for about two more minutes, until the music stopped, she sang. Staff Writers Shelly Bradbury and Evan Hoopfer contributed to this report. Contact Staff Writer Tyler Jett at tjett@times freepress.com or at 423-757-6476.